By combining mustard, jade and caramel, Lotte has produced contemporary looking projects with a real gorgeous retro vibe. She shows us an easy way of producing your own matching paint sprays and some subtle shading with Frescos too. 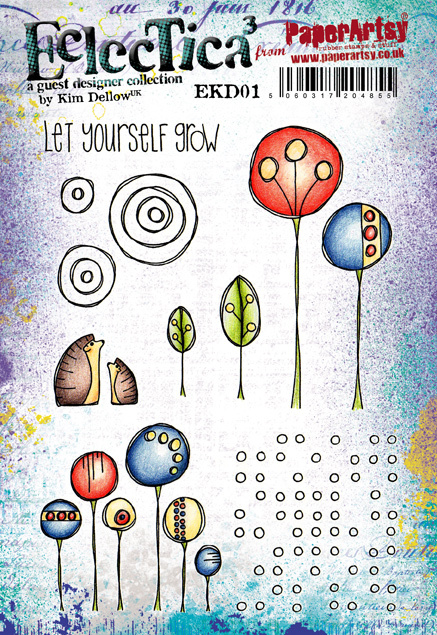 Hi everyone, it's Lotte Kristensen here today, and I've been playing with some of the older Eclectica stamps from Kim Dellow - the EKD01. This is a brilliant stamp set, because you can do so many different things with it: stamp and colour in (which I did with the first card) or using the stamps as design features, as I did with the second card. Yeah, I got a bit carried away, so thought I might as well share both with you! Now, since the topic is Mustard, I looked at these stamps and thought that they reminded me of that wonderful 1950's interior design, so I decided that the Fresco Finish Acrylic Paints in Jade and Caramel would provide a nice contrast and give me that sort of retro vibe I was after. For the first card, I cut a piece of 300gm watercolour paper measuring 4.5" square, stamped the balloon flowers and leaves in Versafine Onyx Black, and let that dry thoroughly. Next, I painted the images with thinned down PA Fresco Finish Acrylic Paint in Mustard Pickle, Jade and Caramel. This combination is really zingy! The way to achieve shading is done by wetting the image with clean water, before adding thinned down paint; slowly adding more to the lower parts of the image whilst keeping the top lighter. If you find you've put on too much paint, it's easy to remove it by dabbing once with a piece of kitchen roll or a baby wipe (one dab at a time, or you might end up adding unwanted splotches of colour!). I used the circle stamp - holding the smallest circle on my fingertip (i.e, not on a block) and stamped randomly in Archival Ink/Paradise Teal. I stamped the sentiment in Versafine Onyx Black, and some more circles in Archival Ink/Chrome Yellow and layered onto black cardstock' leaving a 1/16" edge. Finally, I layered the entire piece onto black cardstock, again with a 1/16" edge, before sticking to the front of a 5" square kraft card. Looking at this card, I can almost hear cool East Coast Jazz playing in the background! For the second card, I cut a piece of watercolour paper as before. This time I made up some paint sprays by mixing a little bit of the Fresco Finish Paints in Mustard Pickle, Jade and Caramel with distilled, boiled water. I used some tiny atomiser spray bottles, adding the water with a pipette. You want quite a thin spray, so about 1/6 of paint to 5/6 water. Next I sprayed the watercolour paper with plain water, before spraying with the Jade MYO (make-your-own) paint spray. I dried this with a heat gun, before spraying with MYO paint spray in Mustard Pickle, dried, then a wee squirt of MYO paint spray in Caramel, and then a wee bit of Infusion Dye Stain in Slime. Dried with heat gun, and then got ready for stamping! Using Archival Ink Pad/Garden Patina, I stamped the larger circle stamp randomly all over; next, stamp again using Archival Ink Pad/Chrome Yellow. After that, stamp the smaller circle stamp in Archival Ink Pad/Paradise Teal. On a piece of watercolour paper measuring 4.5" x 1.5", I stamped the leaves in Archival Ink/Paradise Teal, then layered on black cardstock, leaving a 1/16" edge. On another piece of watercolour paper, I stamped the sentiment in Versafine Onyx Black, then stamped the larger circle stamp in Archival Ink Pad/Chrome Yellow, before trimming it down and layering on black cardstock, again with a 1/16" edge. Once I'd decided where these pieces would go, I stamped the leaves again in Versafine Onyx Black before gluing the panel onto the front. I finished off by layering onto black cardstock, once again leaving a 1/16" edge. As I'm really into Kraft cards at the moment, I used one again for this project! So, both cards together - one stamp set, two different looks. It's great being able to get so much out of your stamp sets! I liked both processes - the stamping and colouring in on the first card was quite peaceful (I don't like calling it mindfulness!!) and I liked the vibrancy of the colours against the plain white background. The second card was more experimental, because you don't have quite as much control over where the paint spray goes, but I like the unpredictability of this, because you usually end up with lovely marbled, colourful backgrounds, ready to stamp and collage with. It's so much fun making your own paint sprays too - and of course you can mix your own colours as well! These are lovely Lotte. I love the fresh feel. Of the colours. Beautiful. Ohh love this Lotte..stamps 2 ways! the sprays are super fun!! I love both of these and it also brought back memories of a Mustard painted wall that was eventually painted over with Jade green......oh the seventies!!!! Thank you all for your lovely comments - I really appreciate them :D Chris, I laughed so hard at your memory of a mustard wall that went jade - if only there had been PA stamps around then LOL! Love these cards, they are fabulous!